The possible variables in composition for any given sword blade are often so numerous that they defy counting. It is now understood that this variation is the result of attempts to produce a blade that solves material and design challenges present at a given point in time. 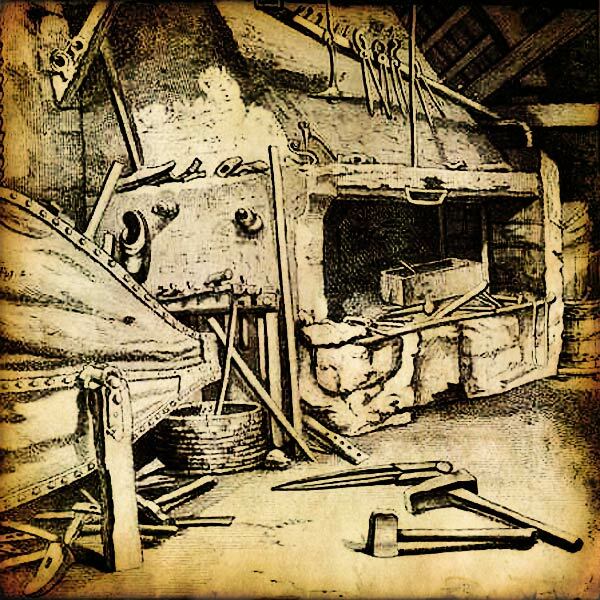 For thousands of years, craftsmen have applied their best technology and effort in this creative process. The understanding of these historic pieces is growing all the time. As knowledge increases, challenges arise to some of the assumptions about what truly went into the swords of the past. There is no perfect blade design. The blade of every well-made sword is unique, comprised of a balance of objectives and components. These attributes, in proper proportion, produce a blade with a certain harmony; whether that harmony is appreciated is a matter of personal taste, within the additional defining context of its historical period. Recognizing this shifting universe of maker, available material, purpose and additional preferences is crucial for the serious student, collector, or maker of swords. One aspect of Medieval sword composition that is often touted by modern enthusiasts, but is little understood, is the hardness of the blade itself. Many will use conjecture and outright guessing when discussing the hardness of original swords. 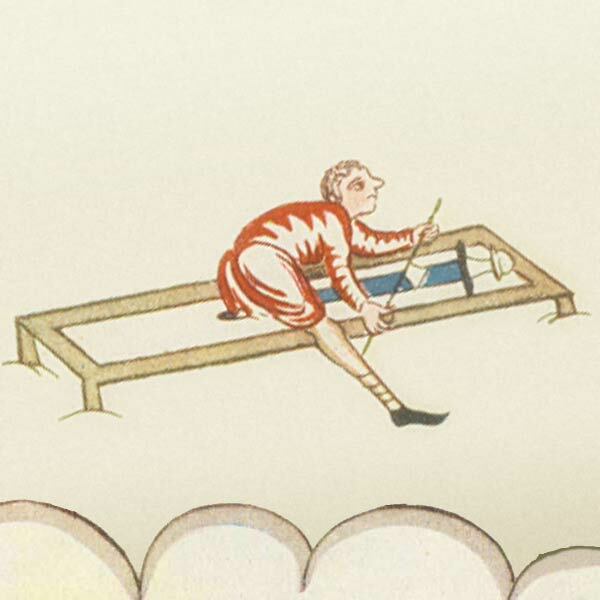 It is important to look at the materials available to the artisans of the era, the blades produced, and the resulting accomplishments given these materials. I would like to briefly address the composition of the blade, while recognizing that this is a complex topic; in general, there would be a long list of microstructures, elements, photomicrography and constructional drawings for any given sample. The blades that have been tested are not numerous, so while we can describe in general terms what is broadly indicated, we cannot conclude that a certain percentage of period swords were of any particular make-up. While in any given area it was possible to produce a superior product in this era, the general production quality of steel was a limiting factor on what type of tempered blade the craftsman could produce. The majority of period swords that have undergone testing appear to be of a steely iron mix. This mixture of variable carbon and alloy content would regulate the hardening results possible in a blade. The material would also produce, in heat-treatment, a hardness that would differ dramatically from one point on a blade to another. There are some examples that have been tested that do, however, show a fairly even mix of elements and carbon content, but this is in a relatively small group of the items tested. What little has been documented on the historical pieces shows a range of composition and carbon content that is far larger than the tightly designed specs of modern mill production steels. In the period swords we are looking at, there are indications of a carbon content range noted on six of the blades. They show carbon in levels from .1 or less (in all) up to .8 with four of the six being .6 or less. This indicates that even in the highest quality period blades of this group the carbon content ranges over a much larger area than modern steels. In the current marketplace there is much that is said about the hardness of blades. In fact there is customer resistance to production of swords that are not hitting certain benchmarks on specific hardness scales. Why is this? It may well be a desire by our modern minds to latch onto a definitive qualifier. We want to say, "This is better than that because of X". The inherent problem we create with this approach is that steel does not work that way; it is a balance or harmony of competing functions. Flexibility, edge holding ability, tensile strength, material composition, material manipulationthese are all considerations the craftsman can manipulate and all will have a bearing on what the end result may be. 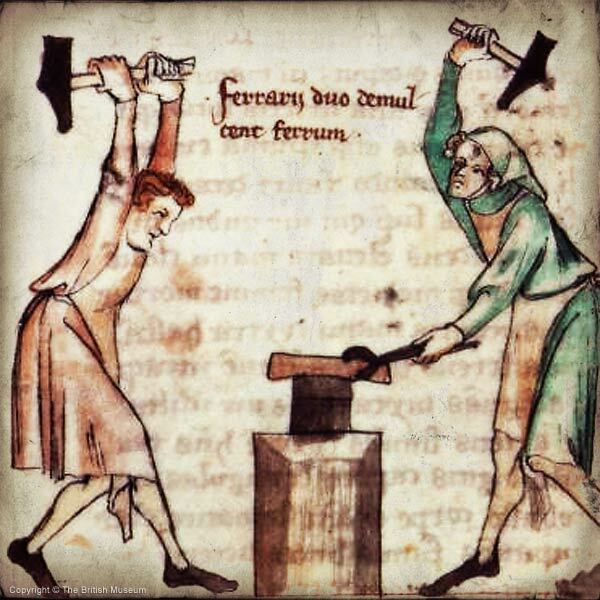 To help understand this issue in a way that will increase one's ability to assess swords made today by comparing them to those made in the past, it is probably most advantageous to start with some definitions. This is key, as often those who make declarative statements about the importance of this or that test score for a blade cannot describe what they are actually testing when asked. This is an average of the diameter of an impression made in the test medium. When it is fully listed, the number should look like this: 481 HB 10/500/30. This is translated as a Brinell Hardness of 481 using a 10mm ball with 500-kilogram load for 30 seconds. This test is usually viewed as having the highest degree of general accuracy. This process involves measure of the surface area of a pyramidal indentation into the test medium under a given load and duration, providing a quotient that can then be translated into the Vickers number. This is usually accomplished with a conversion table. The number will be represented as 513 HV/10, which indicates a Vickers Hardness of 513 with a 10Kgf force. The strength of this system is the use of one scale, from top to bottom of the hardness range, and one indenter type throughout. The Rockwell test is a measure of the depth of penetration when set to equilibrium with the testing machine under a minor and major load. The result is read directly from the machine. This test is the quickest test to perform, but is also the most susceptible to error and machine differences. The Rockwell scale system is a bit arbitrary, as the A-V scales relate to each other, and it is not exactly translatable to the other systems. There is a general understanding that Rockwell numbers will vary +/- 2 points either way as an acceptable industry standardi.e., 50Rc can be 48 to 52 and pass general industrial inspection. 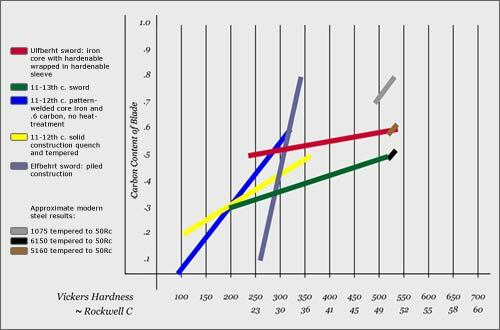 Of the three, the Rockwell scale C is the range that best covers the hardened steel we will be discussing. Hardness is defined as the resistance of a smooth-faced material to scratching and abrasion. This was the measure that one sees the earliest hardness scales assessing. The Moh's scale that most people are introduced to in science class is a numeric scale of what mineral will scratch other minerals. It is not calibrated from one level to the next, though, and most steels, soft or hard, would fall in the same level. As modern industry began to need a more refined scale, the other systems were developed. The Brinell and Vickers measurements arrive at their numbers by measuring the resistance to displacement, while the Rockwell scale is more a measurement of resistance to penetration. This is why there is not an exact correlation between the scales, and why the Vickers and Brinell systems can be correlated roughly to some measure of tensile strength while the Rockwell numbers do not. I would also like to comment on another methodology that is used by some knife makers and has been the subject of some discussion in the sword field as well: the use of hardness files. This is done with a set of files graduated in hardness. The file test is most useful in making general comparisons rather than generating a specific number. They are also only testing the actual surface material on a given spot. The drawback to file testing is the actual hardness of the file and the inconsistency of the load applied to the test stroke. The file sets themselves usually have a five point range in which they are effective, i.e., a typical set of files would be calibrated to 30, 40, 45, 50, 55, 65. Thus an experienced tester with a trained consistent hand would probably be approximating a hardness number in a 3 to 4 point range. The variables present in such a process create difficulties for limited testing on a few samples with files and should be viewed cautiously in discussions of test result specifics. As described above, the hardness of a sword blade is a test of its surface resistance to abrasion and indicative of its edge-holding ability. There are some correlations to tensile strength, but the flexibility and other factors of a blades totality are not closely linked to these specific numbers. With the knowledge of what the hardness tests indicate of a blade, we can now turn to look at some of the surviving swords from the period. Looking at the tests that have been done, we can see where they indicate the Medieval sword manufacturers were setting their goals, and what the medieval customer was purchasing. The comparisons from one sword to another and one author to another should be made carefully. There is not a standard methodology for describing a period blade's hardness and constructional attributes. What one researcher may choose for a sampling of the blade may not be the same areas or number of spots checked by another. 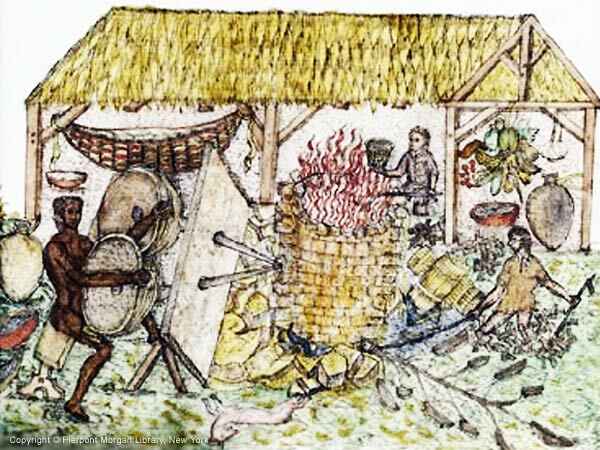 An archaeolo-metallurgist may choose different areas to test than a bladesmith would. It is thus very important to pay attention to the methodology of any results upon which to base a supposition. A key goal for anyone doing this type of research should be to quantify the true quality of a bladea very difficult task. Several different researchers have tested the blades that I will be referencing here over the last twenty years; I have tried to use those examples with multiple spots tested per blade. This allows a better view of what made up a period blade, as pieces tested in just one spot will be unreliable as indicators of the nature of that blade. Furthermore, the items all appear to be working weapons of their period. The number of swords tested is not statistically significant when compared to the number of swords made over the historical period. Thus we must use these as anecdotal examples that may indicate the range of what was done. As more information is gathered we can refine the picture, but at this time it is the hard evidence we have to work from, much better than the oft-repeated "true" stories that no one can source or document. The most definitive characteristic that we can see from the hardness testing that has been done on original swords is the fact that the hardness varies dramatically throughout a piece, not just surface to core or edge to mid blade, but literally in the span of the material the hardness will fluctuate through quite a range. As an example, an 11th to 13th century sword in the Hofjagd und Rustkammer shows a range of hardness from 119 to 520 VPH.4 The average of the piece is 217VPH. The sword was additionally tested with four samples removed from the blade. These pieces were tested across the thickness of the blade and the microhardnesses ranged from 258VPH to 329VPH, with an average of 300 VPH. When we would describe this sword using the Rockwell system, we are looking at a piece that ranges from less than 20Rc to 50Rc, with the average still below 20Rc. 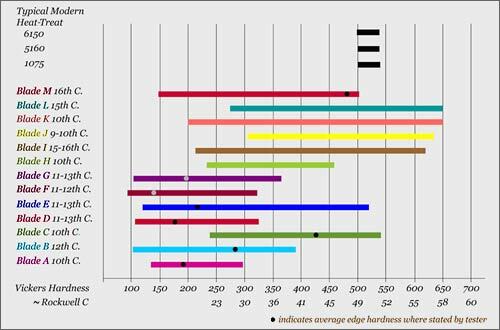 This graph details the range of hardness found in several period blades compared to what modern replicas generally are listed at by their manufacturers. Keep in mind that the range on the period blades includes all points tested on the sword; thus the upper and lower numbers may be just one point on the blade and not correlated to edge or core areas. A dot has been applied to the ranges on the period swords to indicate where the testers listed an average edge hardness for that blade. The total number of blades with documentation for multiple test spots was 20. There are several more blades documented with no comment on number of samples per blade or where the excavated quality of the blade may have affected the results; I have not included these. I felt it would give a better picture of what the blades of the period were to choose those examples that seemed to represent solid, well-made blades of the period that were tested multiple times. This subgroup consisted of 13 swords. 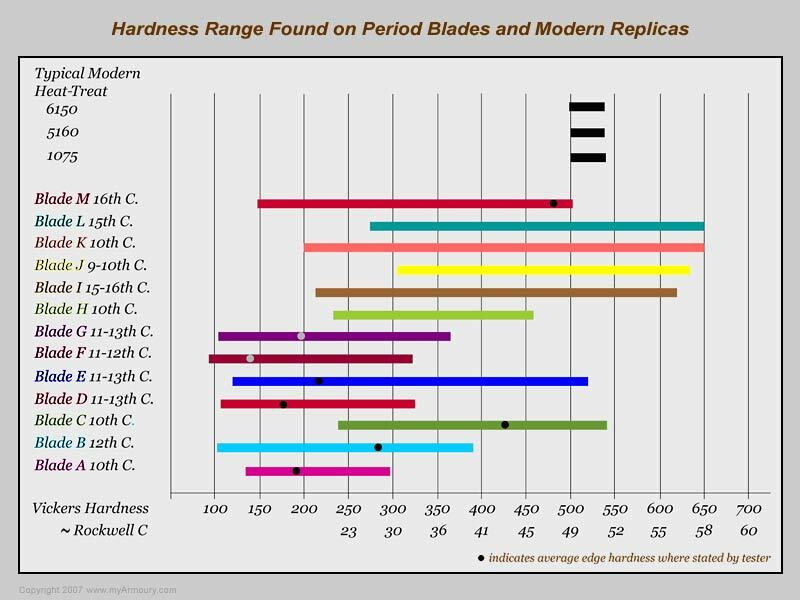 The range of hardness in the group ran from 93VPH (no Rc equivalent) to 650VPH (~58Rc), and these blades all demonstrated a range of hardness in different areas of each blade. There were indications of several different construction methods, including core-wrapping, pattern-welding, piled and edge application. 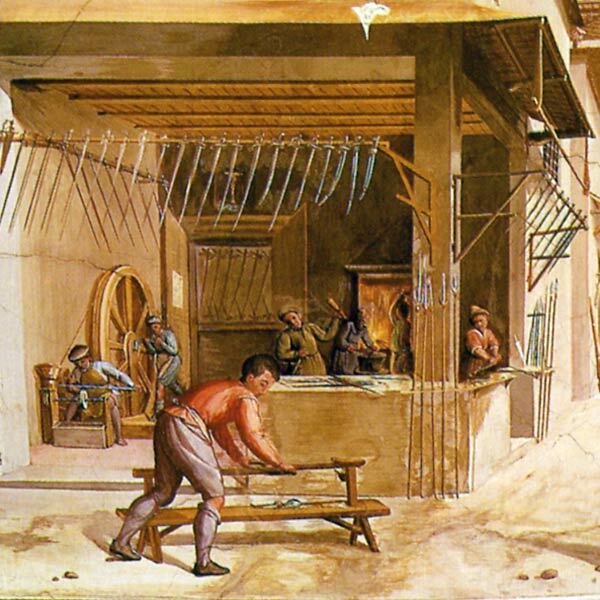 Heat-treat evidence showed that majority of blades were slack quenched with differing degrees of success, and there was evidence indicating a quench and temper process in a few of the blades. There were two blades that showed no evidence of heat-treat at all. This group numbered seven blades and ranged in hardness from 136VPH (>20Rc) to 650VPH (~58Rc). These blades showed piled, billet, core-wrapped and carburised iron construction. This group showed evidence of slack quench and quench/temper operations being performed. The edge of a blade is where hardness is usually the most desired and the area of greatest comment. If we take those blades that specifically tested areas of the edges and look at the range of hardness, we find a sample of nine items where this is listed. The highest number detailed for specific points on each edge ranged from 200VPH (>20Rc) to 540VPH (~52Rc). Seven of the samples are below 460VPH (~46Rc), with the remaining two testing at 520VPH (~50Rc) and 540VPH (~52Rc). The investigators listed the average hardness of the edges in seven of the samples. The two swords listed above averaged 217VH (>20Rc) and 476VPH (~47Rc) respectively. The other five swords had one at 279VPH (~27Rc) and the remaining four averaging between 133VPH and 217VPH (all >20Rc). This range of hardness appears to be due to two factors: first, the material the blades are constructed from, with variable carbon content present in different sections of the blade; second, the heat-treat process attempted on the blade, such as slack quenching compared to full quench and temper. As the variations in carbon content of any given sample of material limits the achievable hardness possible in the quenching process, this is a limiting boundary and is connected to the success of any heat-treatment. One must also keep in mind that the quenching processes varied from blade to blade. Such elements of this processincluding initial heat temperature, quench medium, quench time, cooling rate and whether the sample was tempered or notplay important roles. The following graph illustrates the comparison of some period samples to some steels used for today's replica blades. 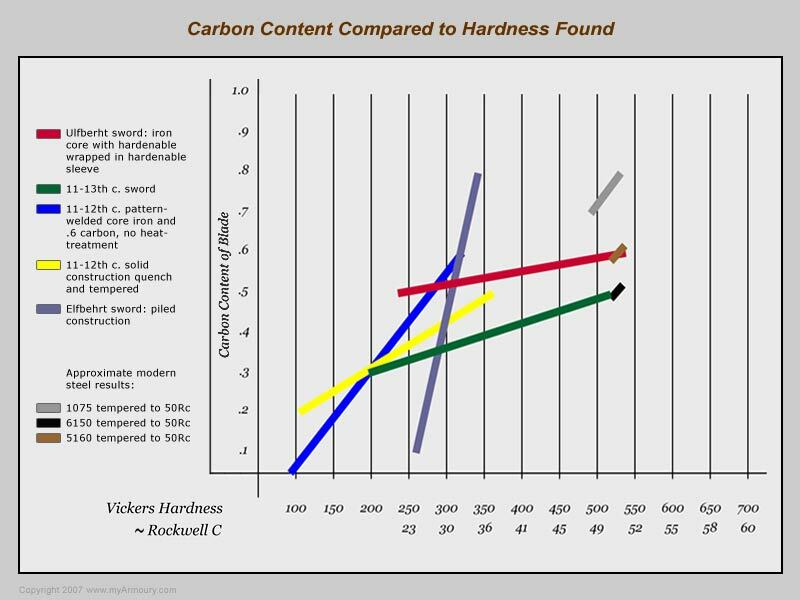 The carbon content and hardness are shown. The modern pieces are given a standard heat-treat with 50 Rc as the target. 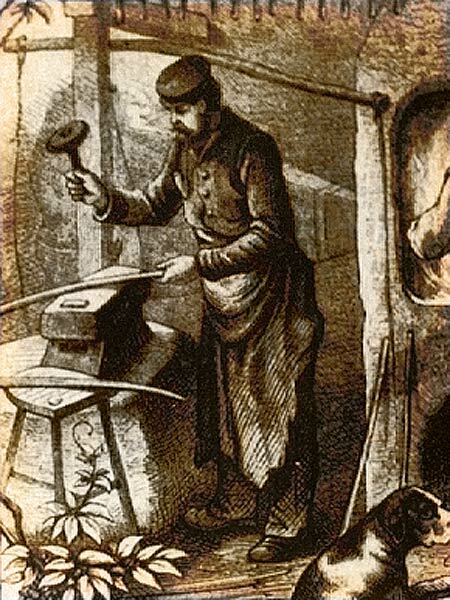 This clearly shows the significant advantage modern steel has in crafting a consistent product, as compared to the challenges the period smith had to overcome in production of sword blades. Another important factor that would have significant impact on hardness was the construction of the blade. The blades in this group show piled, billet, core-wrapped, pattern-welding, carburised iron and edge application construction (See appendix). With the variance in material and methodology for blade manufacture, it was a distinct challenge to the period smith to produce a blade that would have had as tight a window of hardness range as modern steels are able to produce. In some cases the construction of the blade indicates this type of hardness range was not a goal of the smith. Thus one must ask whether that challenge was something they were even interested in achieving as a result and we will need a great deal more research to answer with any confidence. 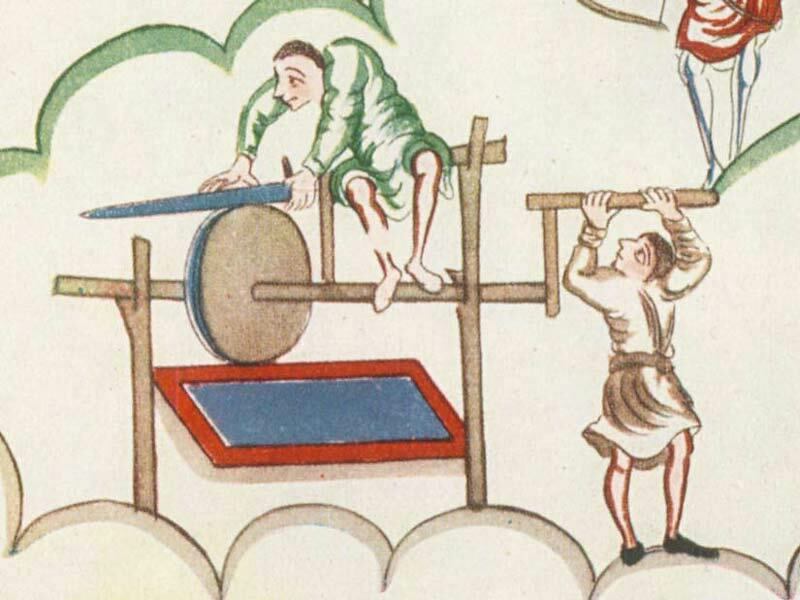 The knowledge base concerning medieval swords has been expanding quickly over the last several decades, and we have learned a great deal about the pieces as working tools. The development of this research has been crucial to opening our eyes to the reality of what makes a sword. The examples we have reviewed here illustrate that the hardness of a sword, an attribute dear to the modern maker and consumer, was not always an attribute that the period makers where emphasizing. The two examples with no heat-treat are indicative that a choice was being made on how hard a sword needed to be. 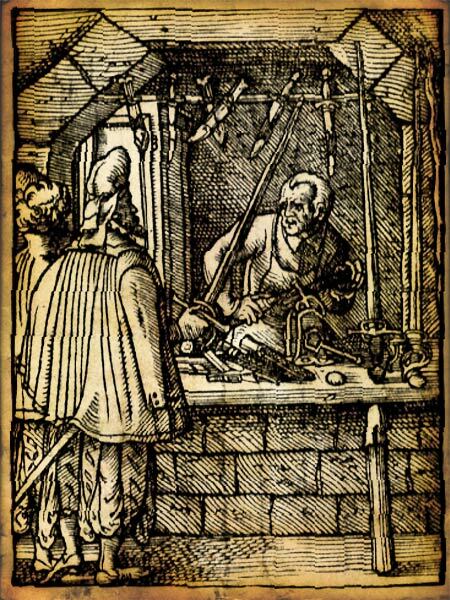 It also enlightens the modern sword user to the fact that a piece with less than the perceived ideal for hardness and composition was considered a functional blade by the medieval craftsman and one that would be acceptable to at least a sector of their market. The quality of information in a discussion of these topics is very important, and as we do not have a large number of examples on which to base conclusions, further discussion is warranted. The evidence presented above is that which has been published and completed in a manner that can be qualified and examined. The "best blade" of the period could well have different attributes than those detailed above but one must recognize that the production of sword blades was a large industry and one that had many quality levels. Discussions of what is accurate for replicas to emulate today should begin with the known and look to the hard data one can find before definitive statements can be considered. The above evidence in no way excludes period blades from being outside the areas that have been shown above; it only takes one documented example to show that they were able to do so. But some of these particular blades tested seem to be good quality pieces of their period. These blades do show that the working range of blades exhibited by this sample were different then the oft-declared "average medieval blade". It leads one to consider that we may be too focused on certain numbers when looking at what makes a sword. The attributes the period customer and maker felt were important may have been different than our own. Craig Johnson is a craftsman who has been making swords and armour at Arms & Armor, Inc. in Minneapolis for about twenty years. A desire to study and learn about medieval and renaissance weapons and armour stems from a deep love of history and a misspent youth of watching Errol Flynn movies and the 70s version of The Three Musketeers. An interest in how these items were used also lead to a study of western martial arts. He also holds the position of Secretary to The Oakeshott Institute. Research continues in this area and the author would be interested in hearing about any new publications dealing with sword blade composition and hardness not listed below. The author wishes to thank Peter Johnsson for consultation, insight and critique. I would also like to thank Melissa, Mark, Ian, and Reece for their comments and critiques. 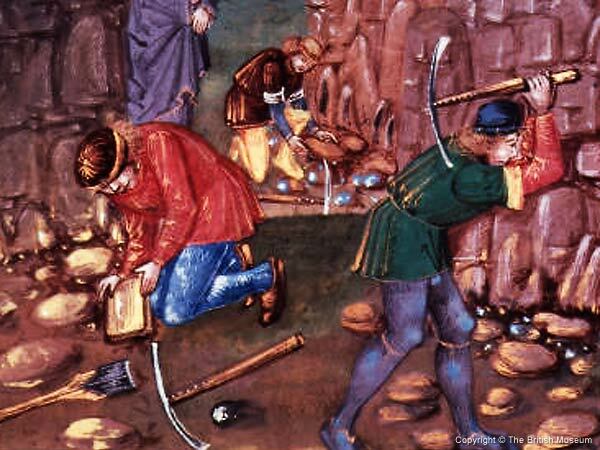 Early Metal Mining and Production. Smithsonian Institution Press, 1995, Washington, D.C.